In winter gear is always a little bulkier and heavier. You can spend a lot of money on the lightest and warmest items but you will still be carrying more weight than in warmer conditions. In summer things come easy but in winter you must always think ahead to what you are next about to do and therefore wear. Operating in below freezing conditions is challenging but rewarding in so many ways and I think that being out in – 20°C and having your nose hair freeze is all part of the fun. My recommendation below is based on my personal experience and works for me very well. The set up of layers has been refined over many years. What works for me may not work for you of course. • Manage your temperature by thinking ahead to what you are about to do. “Be bold, start cold” If you’re sweating into your clothes then this moisture will take away from the warmth offered by your clothing. Left unchecked this moisture builds up and will leave ice crystals in your clothes. So before you climb a big fell or start to saw some wood take off a layer or two. • Use multiple layers of wool of increasing thickness. • Make sure your layers are not super tight against you but are somewhat fitted so they are not loose but also not constrictive in any way. This is called expedition fit. • Have a layer to cut windchill, snow. Mixed conditions you may also need a waterproof. • Having ventilated trousers that you enable you to dump heat without having to stop and remove a layer is fantastic. • Glove liners or thin gloves to hike in as well as mittens for when you stop. Again wool liners and inners are best. • Wool neck gaiter and buff are essential items. • Sunglasses, one darker pair and one lighter tinted pair helps when faced with bright or dull days. Snow is so reflective and uniform it’s essential to have appropriate tints to show details in the landscape when moving across it. Polarised, Cat 3-4. Synthetic Down Insulation – Much lighter than a heavy fleece and warmer too. I use a smock design. Large over jacket. Synthetic fill goes over everything to keep you toasty. 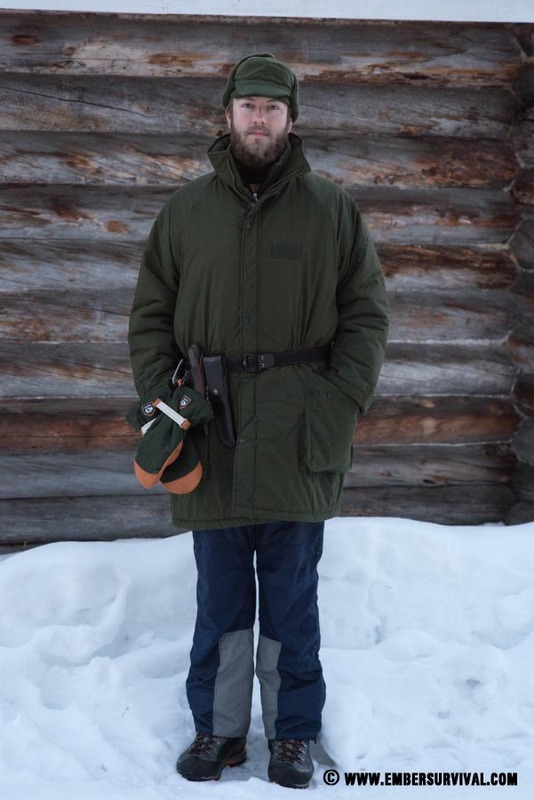 Swedish M90 Parka is my personal choice. Full review of this great value parka HERE. Removable thermal liner boots. Waterproof and with a strong sole preferably with a back wedge to hold a snowshoe binding.